The Complaint, the Exhibits, and all Summonses were captioned "district court of the United States". All documents were mailed to the "district court of the United States". Any other person or court opening that mail would be in violation of Title 18 Section 1342. The summonses were initially submitted for issuance by the clerk, but lacked a reference to Rule 12 of the Federal Rules. Magritz called the clerk's office and talked to a supervisor named Hughs. 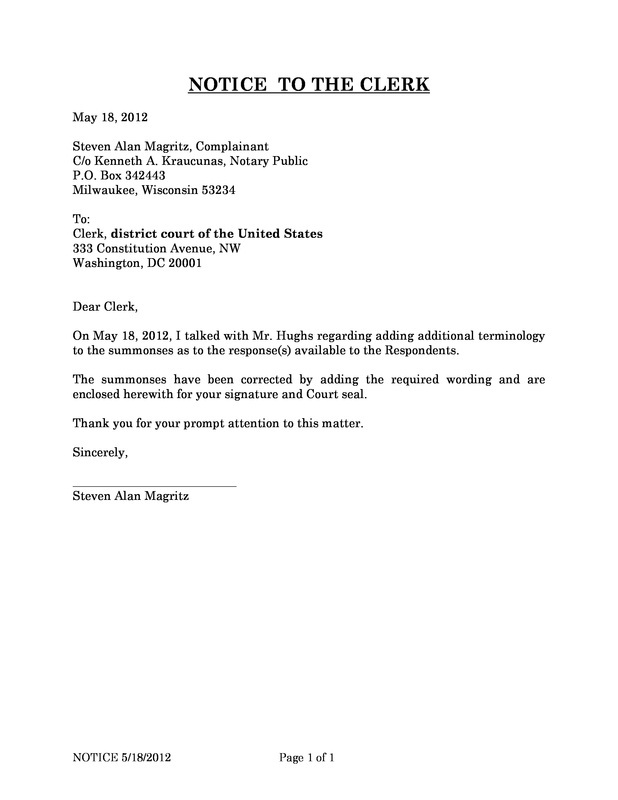 Mr. Hughs stated that the submitted summonses were fine in every respect except for the want of reference to Rule 12. Magritz then resubmitted the summonses and they were issued by the deputy clerk, Sheryl Horn. The first downloadable file above is the May 18, 2012 Notice to the Clerk accompanying the resubmitted summonses after talking with supervisor Hughs. This Notice was not posted on the court website. The second downloadable file is a zip file with all of the summonses issued by the court. 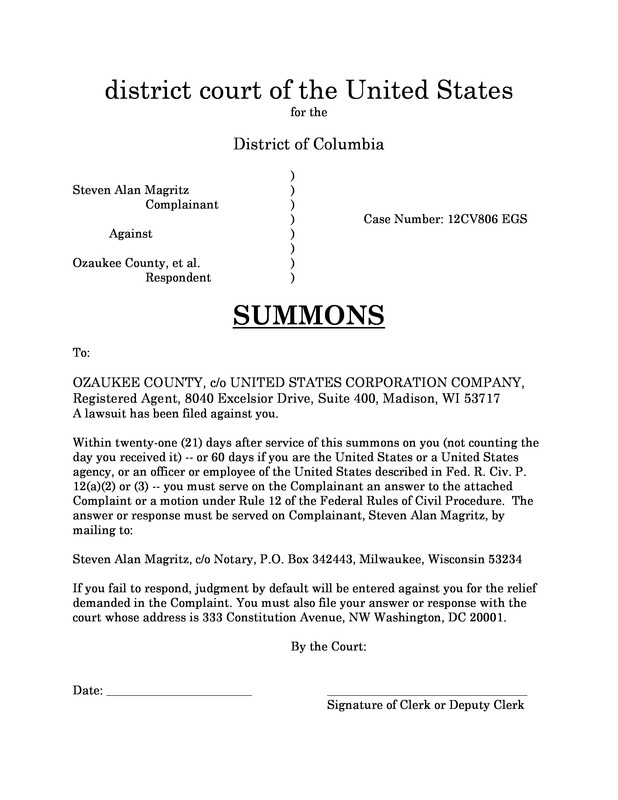 The third downloadable file is the summons that the court refused to issue and return to Magritz for service on the Registered Agent of the Corporation named Ozaukee County. Evidently in their eyes, Magritz was not supposed to have knowledge of the existence of the Registered Agent for the Public Corporation. This information is available on a "need to know" basis, and only the "right" people have a "need to know" in their eyes. The fourth download is the summons that was not served on Timothy F. Kaul because he died before he could be served. All of the summonses were served except those two stated above plus the summons for William S. Niehaus, an attorney and member of the Board of Supervisors, and member of The Ozaukee County MOB. The process server made ten (10) attempts to serve attorney Niehaus over the course of a month on different days of the week and different times of the day. The process server observed a car in the driveway; he observed someone in the house who would not answer the door; and he left his business card. Attorney Niehaus "dodged" being served and never called the process server. 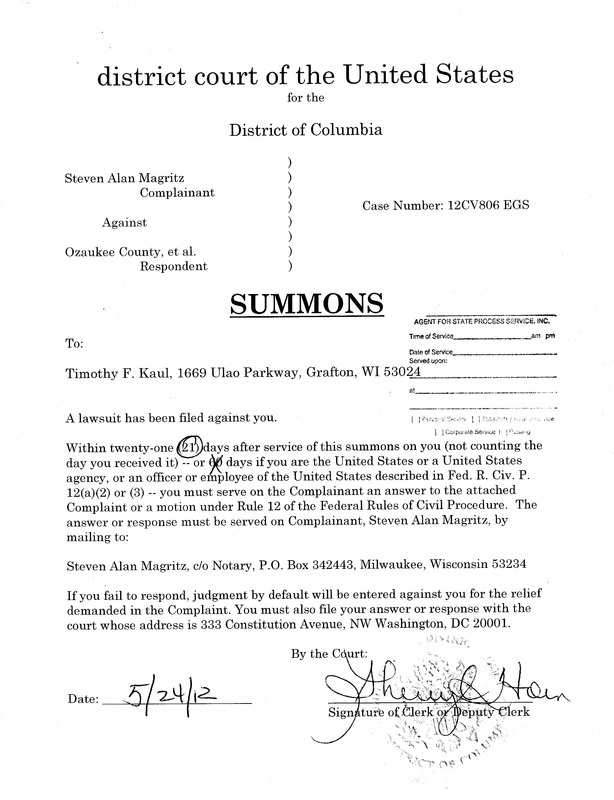 Notice that all of the summonses were issued in the name "district court of the United States". The relevance of this will become obvious later on. Also, the postal money orders for the filing "fees" were "pay only" - to "district court of the United States". They were not "pay to the Order of" like checks are.